Sours constitute a major beer style and there are hundreds of different variants available, primarily brewed by artisanal breweries with a flair for experimentation and bold flavours. Sour beers were not available in Malta and it was only recently that we’ve seen imported sour beers appear in fridges in some boutique eateries and leading craft beer bars. The truth is that sours are not as easily likeable and marketable as light lagers. That said, while sours are likely to put off someone with a single sip, they are hugely rewarding for those who can get over the initial shock. Just as lemons, HP sauce and pickled onions crinkle up the face, so do these beers. And just like those foods, once you gain a liking and taste for them they can dominate your food life – and there’s no turning back! Sourness is typically given to beer by bacteria or wild yeast. If not closely monitored, this bacteria could also naturally give off unappealing aromas. It therefore takes a skilled brewer to venture into brewing sour beers. 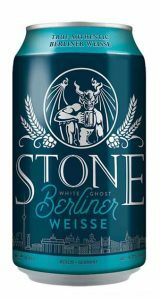 A great example of a particular style of sour beer is the Stone (US/Germany) White Ghost Berliner Weisse, which hits you with an eye-watering acidity, but then finishes off super smooth just as the brewer wanted it to. Sour beers like the Stone White Ghost are an acquired taste. In pubs in Berlin, Berliner Weisse style beers are enjoyed by many mixed with apple or blackberry syrup, giving the drink a sweeter taste rounding off some of the sourness. Needless to say, this adulterated brew does not impress orthodox beer drinkers and brewers, and yet is enjoyed by many. In Malta this idea is fairly new but is gaining traction in some places, especially where Stone Berliner Weisse is available on tap. There are flavoured versions of the Berliner Weisse (BW) like Mikkeller’s Watermelon BW which also comes in Blueberry flavour! 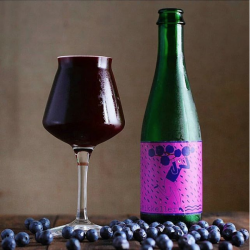 Another remarkable, and very different sour beer is Mikkeller’s (Denmark) Spontan Blueberry (Raspberry also available) which is a spontaneously soured beer using wild bacteria that is air-borne and practically all around us, including the wooden barrels this Mikkeller beer is aged in! Barrel-aged beer is quite simply beer production elevated into an art form. Combining barrel-ageing with the natural souring of a beer is pushing the limits and this is what the Danish brewer is known for. The Spontan series of beer presents the drinker with the taste of the wooden barrels as well as the nice fruity, tartness given off by the berries. These are dry beers which make me feel hungry, and are great for working up an appetite!